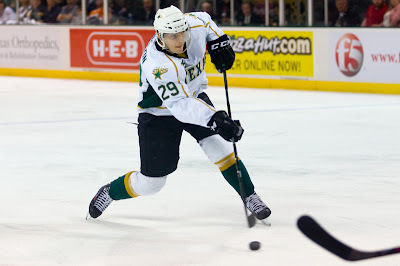 The Texas Stars pushed the Milwaukee Admirals to the brink of elimination in their best of five series after winning tonight 2-0 at the Cedar Park Center. The first playoff game in Cedar Park since 2011 saw Cristopher Nilstorp's first AHL playoff shutout and Alex Chiasson's first pro playoff goal, the eventual game winner. The two teams totaled 52 shots in the game; Nilstorp stopped all 21 from the Ads. "There wasn't a lot of room out there," said Coach Desjardins. "Milwaukee played a great game, and we just got a couple of breaks. They're so hard to create on. There were a few flurries [of shots] in the game, but otherwise it was tight." Chiasson, who scored six goals in seven NHL games to end the season in Dallas, was reinserted in his usual spot with Mike Hedden and Justin Dowling. The line's chemistry was undeniable from the first shift. Chiasson's goal came in his first game back from injury after a collision with Niklas Hjalmarsson of the Blackhawks. "[Chiasson] hasn't played for a while," added Desjardins. "It was a really tough game for him to come back and play. It's a sign of maturity. He prepared himself and battled." Kevin Connauton added a power play insurance goal to set the final score at 2-0. The two teams came out of the gate playing some extremely quick end-to-end hockey. The pace slowed down to the more expected defensive game as the first wore on. Despite the track meet start, the period ended with no score. The second unfolded in a little bit more plodding of a fashion. Shots were 7-4 for Milwaukee after Texas outshot the Ads 15-6 in the first. The teams traded chances on the power play, but Texas's #2 ranked power play had some trouble creating. It all came down to the third period for the two clubs. Chiasson's goal came as he bumped Chris Mueller off the puck and passed to Dowling. Dowling sent the puck back to Chiasson, who tipped it past Hellberg for the 1-0 lead. "You want to be that player, the guy who steps up. There's a lot of guys here who can do that. I'm glad to be back here and helping the team win." Shortly afterwards, Kevin Henderson took an extremely undisciplined penalty, checking Kevin Connauton after an icing touchup. "If you want to win, you have to stay out of the box," said Desjardins. "It's an emotional game. There's a lot going on, but we have to stay out of the box and we know that. The guys are committed to doing that." Texas went to the power play, their fourth of the night. Connauton, who drew the penalty, ended up cashing in. From the point, his shot found twine to make it 2-0. Joe Morrow and Reilly Smith collected the assists. Milwaukee would pull Hellberg with two minutes remaining in the game. Texas twice had chances at the empty net from 200 feet away but just missed. In the end, Nilstorp stood tall to earn the goose egg by a 2-0 mark. Friday's game is a potential series clincher for the Stars. If so, it would be the first series decided on the Cedar Park Center ice in franchise history. Glennie was inserted between Smith and Ritchie, creating a very 'top six' looking third line. Coach Desjardins thought Glennie's play with "really strong". It looks like that line will stay together. Travis Morin was in and out of the lines tonight. Petersen and R. Smith cycled in. No word on any injury that might be affect the Stars' all-time leading scorer. If Jordie Benn has played a better, more poised game at CPC, I haven't seen it. And what a perfectly cast fourth line. Great coaching. Morin took a Milwaukee clearing attempt off his upper body during the game that left him hurting. Presumably that was what limited his shifts during the rest of the game. Anyone have the video of the no-goal? Im hope that surfaces... I was in 103 and could swear that Gazdic put that in!! It looked like we had 4 1st lines last night. I couldn't believe how great Gaz, Wats, and Petey looked out there. On any other team, even earlier this year, that play would have earned them 2nd or 3rd line. Keep it up, boys! You're going all the way!!! Is there any way to easily go back and look at re-caps of earlier games? I'd love to go back and re-read them from the beginning of the season, but only a few articles come up at a time, making it nearly impossible to go back to October. I thought the no-goal got kicked into the net by a Star and was a legit no-goal (and I say that as a Stars fan). I'd certainly love to see video of it again, though, or hear what the official call was. I couldn't tell what the ref's ruling was at the time with all the noise and craziness in the moment. Glad that didn't affect the outcome of the game. I finally got all the way back to the recap of the Oct 13th game. Just for grins, here's what our lines looked like back then. ^ means they went to the NHL and didn't come back. v means they went down to the ECHL or lower. < means they left for another AHL team. - is now out with an injury. Overall, we seem to mostly still have our starting guys together. Four we lost to Dallas (*cries*). Barker was never really permanent and got an NHL contract after the lock out. Those who went down were replaced with stronger. There were only five players on the ice last night who weren't on the team in October. Three of last night's scratches have been with us since the beginning of the year, too.